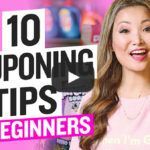 You may have noticed on our blog (and other places where couponers gather) that we sometimes speak in the cryptic couponing lingo — where words are abbreviated into seemingly nonsensical slang. RP – stands for “RetailMe Not insert” (formally Red Plum). Example, RP 6/29 – this means find the coupon inside RetailMe Not insert that came out on June 29th. SS – stands for “Smart Source insert”. Used in the same way as RP inserts. PG – stands for “P&G insert”. Used in the same way as RP inserts. Typically, this type of insert comes out once a month. $X/Y – Short form for $X dollar off Y units. Example, $5/2 stands for $5 off two items. We use this shortcut to indicate the value of a coupon. BOGO – stand for “Buy one get one free”. This could be used to refer to the value of a coupon or a store sale on an item. x – stands for “expires on”. This is used with a date immediately following the little x, which stands for “this coupon or deal expires on this date”. For example: “PG 7/6, x7/31” means this coupon from P&G July 6th will expire on July 31st. IP – stands for “Internet printable coupons”. Print FREE coupons here. OOP – stands for “Out of Pocket”. This is the amount of money you actually paid (before receiving any rewards) for a transaction. We often use the word “Pay” in our breakdowns for OOP. MM – stands for “Moneymaker”. More than Free. This refers to the amount of money or reward you earned as a result of buying the product with coupons. For example, an item cost $1 and you have a $2/1 coupon for the item, that’s a $1 Moneymaker. Or another example: an item cost $1 and you have a $1/1 coupon, plus you get back $1 for future transactions, then that’s a $1 Moneymaker too. WYB – stands for “When You Buy”. For example, this can be used in a sentence like this: This product cost $3 wyb 2. YMMV – stands for “Your Mileage May Vary”. This means that just because a deal worked for some people, doesn’t mean that it will work for everyone. This is frequently used in social media on rare deals such as Clearances, where everyone will have different experiences and finds. Thus, your result will likely vary. ECB – stands for “Extrabucks”. These are reward money from CVS. Read more here on couponing at CVS. RR – stands for “Register Rewards”. These are reward money from Walgreens. Read more here on couponing at Walgreens. IVC – stands for “Instant Value Coupon/Code”. Its a Walgreens coupon. DD – stands for “Double Dip”. When two sales overlap at certain stores and you can dip into both deals. EA – stands for “Early Activation”. When a weekly sale is activated early. MQ– stands for Manufacture Coupon. TQ– stands for Target Coupon. Read more here on couponing at Target. Similar to learning another language, the more you read it and are exposed to it, the easier and more natural understanding Coupon Lingo becomes. Buy one Tampax Radiant Tampons (that’s 16 count) or Pearl (18-20 count) for $3.99 (Sale price). And use one of the $2.00 off one Tampax coupon from P&G Insert that came out on July 6th, and will expire July 31st. Final price after coupon is $1.99. ISO – In search of – the coupon I am looking for. Can someone explain where to find SS and RP inserts? Thanks! Buy one Tampax Radiant Tampons (that’s 16 count) or Pearl (18-20 count) for $3.99 (Sale price). And use two of the $2.00 off one Tampax coupon from P&G Insert that came out on July 6th, and will expire July 31st. Hey. Thanks for catching that. I’ll update that right away. 🙂 Thanks for the sweet comment as well. I am confused for a few wordings, such as spend, buy and purchase, please help me to clarify the below three sentences. Does it mean I have to PAID an actual amount of $30 in order to get the rewards?